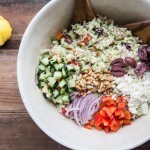 Three years ago now, a fellow blogger and friend, Lindsey from Soul Food Living, and I set out to create some new recipes using cauliflower – Cauliflower Couscous Greek Salad, and Cauliflower Pizza Crust. To this day, this recipe is still one we enjoy for a light winter meal. Because I myself still use this recipe, I thought my photos needed a little updating so I’m reposting the recipe today with new photos and maybe new motivation for you to give this a try! With two cauliflower heads in hand and ideas for a few recipes, we experimented until we came up with something fabulous. After testing and sampling, we came up with two delicious recipes, proving my kitchen mantra that having good company in the kitchen is always the best way to be creative. 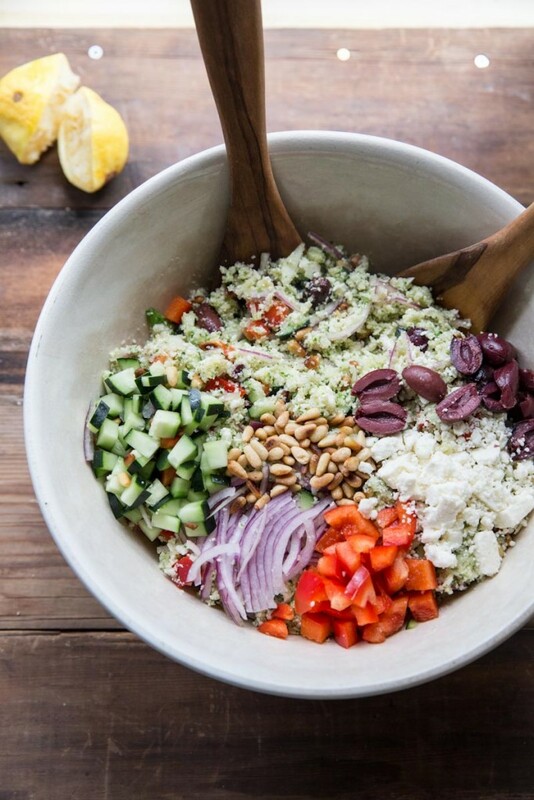 Today I’m sharing a recipe for the Cauliflower “Couscous” Greek Salad. 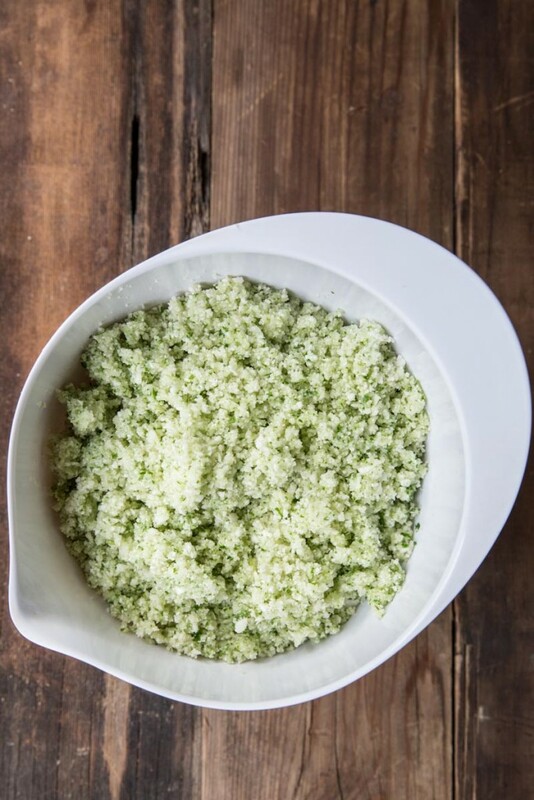 Though there’s no couscous involved, the cauliflower acts as a tiny grain after being pulsed in a food processor; it’s look and texture is almost exactly like that of couscous. 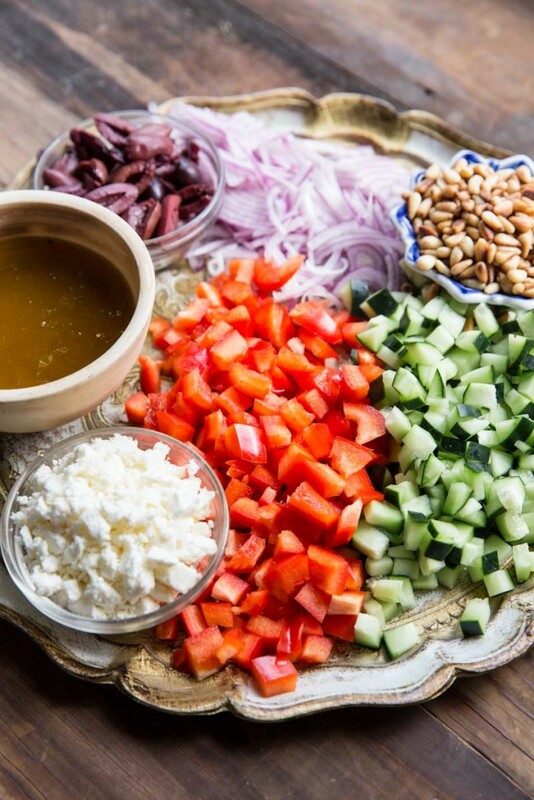 The ingredients for this salad were all found at Liberty Heights Fresh, a great local source for seasonal ingredients! Also, the recipe for this salad was inspired by a cookbook called, The Naked Foods Cookbook. Lindsay and I had both seen several folks lately experimenting with cauliflower similarly, some substituting it for rice and others for crusts and crumb toppings. She had even made a cauliflower fried rice while I recently tried making cauliflower mac n’cheese. Lucky for us, both of our husbands also enjoy cauliflower! As we started our cooking and creating our conversation diverted from cauliflower, interesting as the vegetable is, to so many other amazing topics. We talked about adoption in foreign cultures, and how she spent a year in Tanzania working at an orphanage. 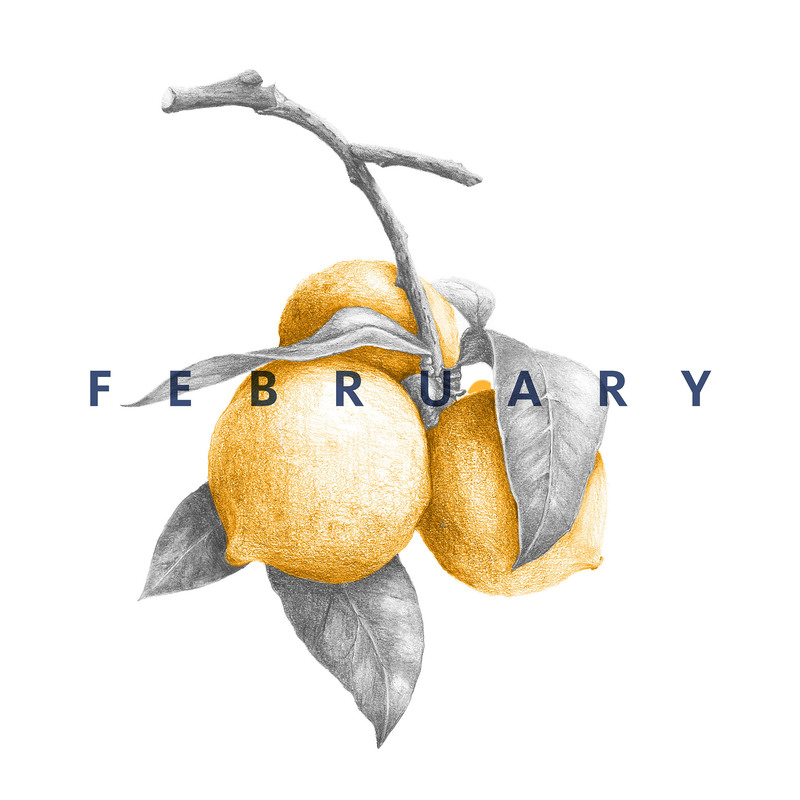 We chatted about nutrition and how important it is during pregnancy, which lead to both of our intrigue into midwifery and the work of dulas. As our hands were at work, we had no shortage of topics to cover. The hours passed quickly and soon enough we found ourselves with successful creations and hungry bellies, so we sat down to enjoy our creations. This salad is light and fresh and will be wonderful to enjoy throughout the entire winter/spring cauliflower season. I imagine it would be lovely using a purple cauliflower or making a little twist in the recipe for several varieties of salads like Cauliflower Cobb Salad or Cauliflower Caesar Salad. Another recipe with endless possibilities. 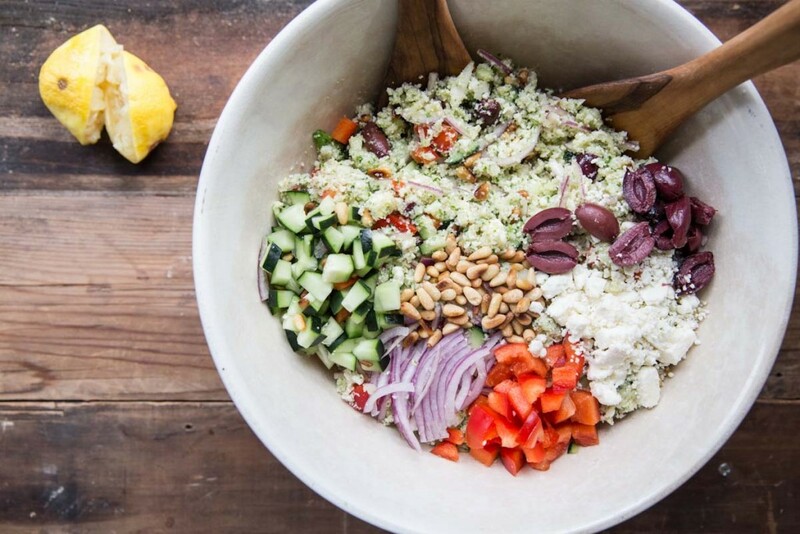 Use raw cauliflower to make couscous (like cauliflower rice) for this Greek Salad. 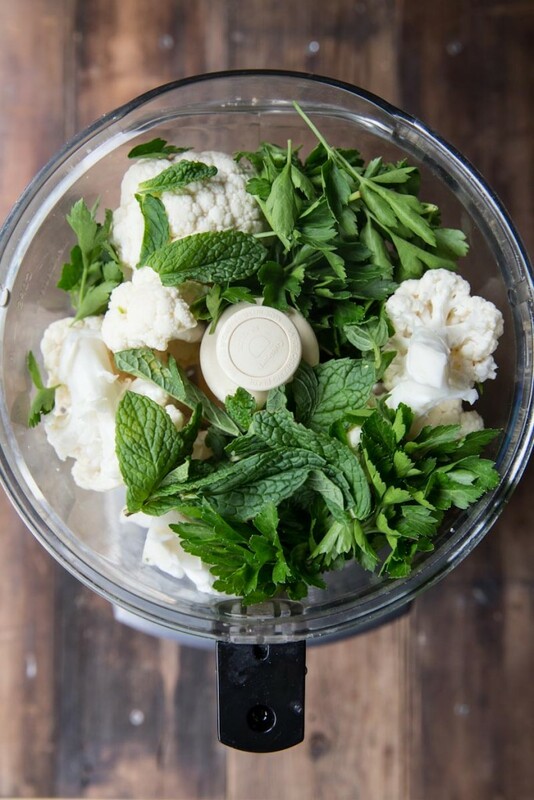 Break the cauliflower into big chunks and put into a food processor along with basil, mint, parsley and garlic. Pulse several times until minced. The cauliflower will have a granular texture - much like couscous. Set the cauliflower aside in a big bowl. Add cucumber, bell pepper, and sun dried tomatoes to the cauliflower. Chop the romaine lettuce and place in a big salad bowl. Top with the cauliflower mixture just before serving and mix thoroughly. Sprinkle with olives, pine nuts, feta cheese, and red onions. I cannot WAIT to try this. It looks amazing, and I wouldn’t even feel bad finishing the whole bowl myself! YUM! I am definitely making this tonight. I am looking forward to this!! I love that the ingredients are fresh and healthy and that it takes almost no time to put together. I love everything about this salad; good work! 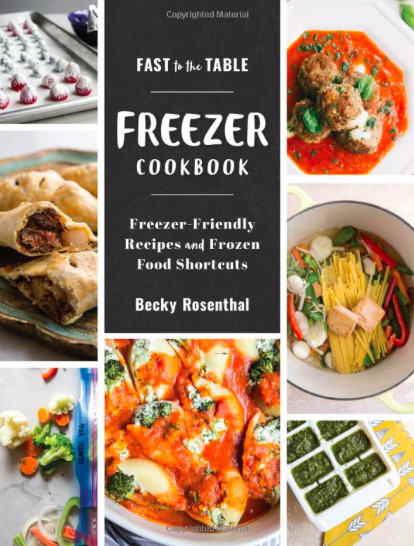 Wow this looks delicious and the pictures are stunning! This looks and sounds delicious. I love cauliflower and can’t wait to be more creative with it. Thanks for the inspiration. I’ve pinned this for (hopefully) many future garden parties! Imagine this as the side dish to some barbecued chicken, oh wow. 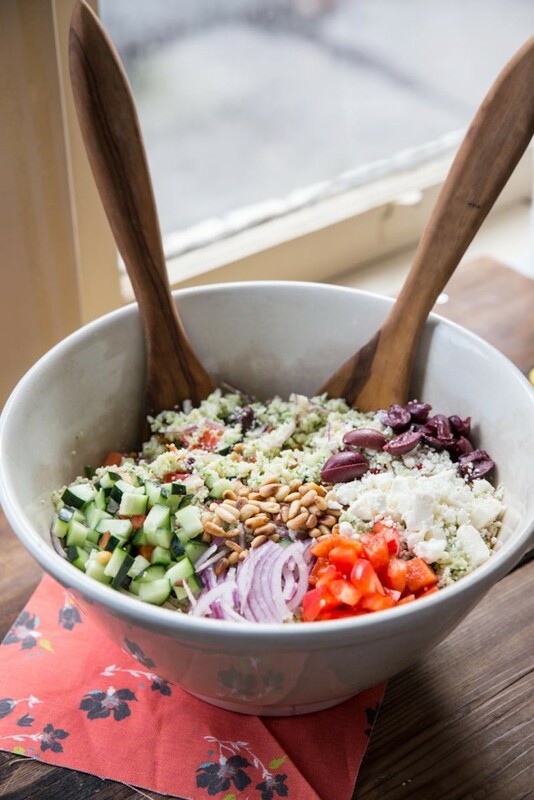 It’s a bit like a tabbouleh salad though – dare I say this – your version sounds more interesting! GENIUS! I just made a couscous Greek salad only with quinoa. I am loving this! I love this! It looks so fresh and full of goodness. I’m so ready for lighter summer eating. This also looks like they’d make good pizza toppings! Just saying…. Have you tried mashed cauliflower? It’s like mashed potato. It’s soooo good! I’ll have to try mashed cauliflower soon. Lets have a cooking date soon! I’ve made this multiple times since we tested this recipe. It is amazing, and I LOVE it in a wrap with hummus the next day! Great idea. I’ll have to use it inside wraps next time! I have a head of cauliflower just waiting for this recipe right now! just made this, was lovely indeed, thank you-added chilli! Wonderful!! Glad I could contribute. I made this last night… so delicious! I like that this is kind of versatile and you can add and decrease ingredients to fit your tastes (I’m not much of a parsley fan so I increased the other 2 herbs). Great refreshing summer recipe! So glad you enjoyed it Melissa! I’m going to have to play around with the herbs next time I make it! I made this today and it is a keeper! I served it by itself (without the lettuce) as a kind of raw energy salad. Loved it! So glad you enjoyed it Margaret! This is very good, I will make it again. I left out the basil, pinenuts, tomato and feta either due to not having available or allergy and it was still good. I am not sure where the 12 minute estimate comes from, it took me almost an hour. Thanks for letting me know Rose! I will definitely re-check my times! I love the cauliflower “rice”, and the flavors are my favorite. A friend asked me for a recipe with cauliflower rice the other day and I’m totally sending her here. Gorgeous salad! thanks Heidi! You should send her my cauliflower fried rice recipe too. We make that one all the time! So fun with purple cauliflower! I’ll have to try that too!